This report was sent to me in a (Microsoft) Word document some time back on PKForum. I am putting it here for those who are interested in reading it. On searching for sources for this document to ascertain its validity, I came to know that this composite report was done by News Central Asia, a private news agency of Turkmenistan. Four correspondents and dozens of associates who collectively logged more than 5000 kilometers during the past seven weeks in pursuit of a single question – What is happening in Balochistan? have only been able to uncover small parts of the entire picture. This breath-taking photo has been taken from here. 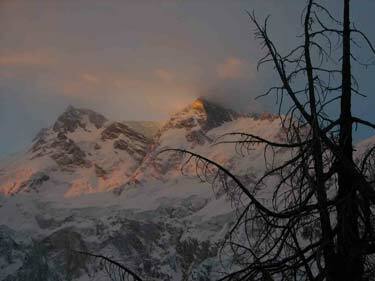 Kudos go to Srosh for photographing such a beautiful view of Nanga Parbat! For those of you who don't know about Bugti, you can read about him on Wikipedia. The security forces killed Akbar Bugti, a tribal leader of Balochistan, and his two grandsons last night. Usually I would protest against such actions but this time, I am quite glad and commend the Armed Forces of Pakistan for this. Akbar Bugti and his grandsons were rebels in Balochistan, commiting terrorism which is armed and financed by India from its consulates in Afghanistan and backed by India, Russia and some American factions (to pressurize Musharraf). The backing provided to these terrorists (in the form of terror and propaganda cells in Balochistan and Afghanistan and modern weaponry) and their illegal activities in Balochistan from the Indian consulates in Afghanistan is a well known fact even though the Indian government vehemently denies it. Over last few months, Baloch rebels have been hard at work planting landmines, firing rockets, exploding bombs or ambushing military convoys and killing dozens including army jawans (soldiers), levies, security agents, Government officials as well as civilians. The Sui airport building has been blown up, gas pipelines and electricity grids have been hit repeatedly, and bomb explosions have been engineered close to the official residence of the provincial Chief Minister as well as the Governor. Even the military installations in Quetta, the capital of Balochistan, have not been spared by the angry nationalists. A fierce gun-battle between tribal insurgents and the Frontier Corps (FC) near Sangsela in the Dera Bugti district of Balochistan province on March 17, 2005, left more than 50 dead, mostly women and children. Bugti was also against allowing the people of Balochistan the right of education. This was all done to keep the poor people of Dera Bugti which included peasants and slaves, under his thumb. His grandsons were equal culprits in all of these activities. People had to get education in secret to avoid the ire of Bugti and his fines of upto 0.5 million rupees. Here's a link for the article about the murder of many people by Bugti and his henchmen for wanting to be educated. These events had become a routine in the province until the current government headed by Musharraf made some efforts to try to control the situation. I commend Musharraf and the armed forces for getting rid of this menace from Balochistan and hope that the Balochi people can now work together against any such future leaders and progress further. This might also help mark the end of the Sardari (feudal) system. It also raised fears that more travellers will take the law into their own hands - effectively conducting their own 'passenger profiles'. Websites used by pilots and cabin crew were yesterday reporting further incidents. In one, two British women with young children on another flight from Spain complained about flying with a bearded Muslim even though he had been security-checked twice before boarding. The trouble in Malaga flared last Wednesday as two British citizens in their 20s waited in the departure lounge to board the pre-dawn flight and were heard talking what passengers took to be Arabic. Worries spread after a female passenger said she had heard something that alarmed her. Initially, six passengers refused to board the flight. On board the aircraft, word reached one family. To the astonishment of cabin crew, they stood up and walked off, followed quickly by others. BBC recently covered the story about posters of Bachchan having a backdrop of the Pakistani flag being banned from the commercial hub, Karachi. This all comes just before the celebrations for independence day on the 14th of August. "We are not enemies of Mr Bachchan. But his picture on our national flag was an objectionable act and we ordered them to remove his picture from the flag," Mirza Asif Baig, a local government official said on Friday. "This place is reserved only for our own heroes," he added. I am not sure how many of you already know about this but giyus.org has created a software called 'Megaphone' to notify the people using it of any poll/discussion criticizing Israel so that they can skew the results (in favor of Israel). GIYUS here means Give Israel Your Unified Support. I recently came to know about this issue. Apparently, some Norwegian paper printed a cartoon of Olmert, the Israeli PM, depicting him as a Nazi commander indiscriminately shooting Palestinian Arabs in a concentration camp. There has been an angry response from the Israeli ambassador to Norway, Miryam Shomrat. Ms. Shomrat filed a complain with the Norwegian Press Trade Committee arguing that the cartoon exceeded the limits of free speech. 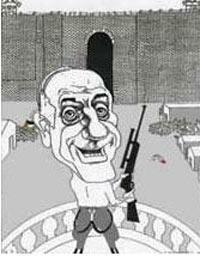 The cartoon of Mr. Olmert published in a Norwegian paper.